High quality cheap telescopes can be a good choice for beginning stargazers, because they provide exciting views of the nighttime sky without requiring a heavy financial investment. All to often beginner’s waste many hundreds of dollars in pursuit of the highest-rated telescope. The best budget telescopes generally offer sound views of the nighttime sky. For instance, most of them provide views of the moon’s craters and planetary features such as Saturn’s rings. Some of them will also offer glimpses of deep sky objects. Consumers should not, however, expect detailed views of deep ­sky objects. The best ones, however, offer an appealing combination of affordability and sound optics, and most throw in simplicity of set up and use to make them even better choices for stargazers who are just starting out. The Celestron 127EQ PowerSeeker with an equatorial mount is one of Celestron’s line of PowerSeeker telescopes designed to offer quality and usability for an affordable price. At about $140, this model is a low­cost investment that will offer an appealing glimpse into the nighttime sky. In addition, it boasts optical advantages such as a 3x Barlow lens that triples the magnification power of any eyepiece, a 127mm aperture, 1,000mm focal length, and erect image optics that allow the consumer to view both the nighttime sky and terrestrial objects. Besides these optical features, the 127EQ PowerSeeker boasts easy, no-tool assembly and easy object tracking. Consumers report being able to view objects such as nebulae, Jupiter, Saturn and Mars, and the only reported downside is that the included 4mm eyepiece does not yield very good views. Otherwise, it offers good optics for an affordable price and provides an easy and appealing way to learn more about the nighttime sky. The Orion SkyScanner 100mm is a portable and affordable entry ­level tabletop telescope that only costs about $100. Its tabletop size and 6.2 pounds of weight make it ideal for storing and transporting in small spaces. The only downside to its size is the fact that the consumer will need to purchase a tripod separately to obtain a more traditional height for the telescope. In addition, the SkyScanner can be set up in about 10 minutes due to its simple design. The SkyScanner’s small size belies an ability to provide big views of the nighttime sky. It boasts a 100mm aperture, three eyepieces providing a variety of magnifications, and a focal length of 400mm. It is capable of providing detailed views even in light polluted areas, and can provide deep sky views when used in dark areas. Its steel construction and one­ year warranty ensure a quality product. The only potential trouble spot for consumers is its finder, which consumers have generally found to be inconveniently located and difficult to use. Otherwise, it receives sound reviews for its performance, simplicity, and portability. The Celestron AstroMaster 114EQ combines a simplicity and affordability that make it a good choice for beginning stargazers with optical capabilities that make it appealing to more experienced astronomers. Even consumers who purchase the Astromaster 114EQ as their first telescope generally report being able to set it up quickly and easily, in part because of the quality of the instructions that accompany the telescope. This telescope boasts an equatorial mount, a respectable 114mm aperture, 1,000mm focal length, and Newtonian reflector design. These features allow consumers to enjoy views such as the surface of the moon, the rings on Saturn, and even some deep sky objects. Consumers can even obtain terrestrial views if they wish. The telescope includes Celestron’s planetarium software, called SkyX, which offers an educational database of celestial objects. 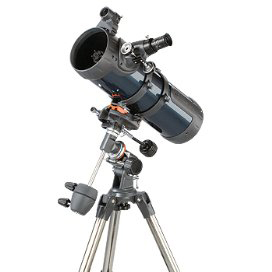 The AstroMaster is generally considered to be very well constructed, and is backed by a two­year warranty from Celestron. The only downside to the telescope is the red dot finder, which is occasionally difficult to use. Otherwise, the telescope provides an affordable and reliable way to explore the nighttime sky. The Orion StarBlast 4.5 is a well­-regarded tabletop telescope designed for ease of use and excellent optics. This telescope comes preassembled, allowing the consumer to simply remove it from the box and use it. Because of its small size, the telescope can also travel relatively easily, although it must be used on a raised surface such as a table if it is to be comfortable to use, due to its small size. In addition to its portability, the StarBlast 4.5 boasts excellent optics that bring into view not only Saturn, Venus, and the moon but also other images such as nebulae and star clusters. These optics include a respectably­sized 4.5 inch aperture, 17mm and 6mm Kellner eyepieces, and a design that simplifies the process of locating objects. These optics make the StarBlast Astro Reflector a well­reviewed product even among more experienced stargazers, who report using the StarBlast not only for quick views but also for the quality of the views that it provides. The only downside is the potential for some discomfort due to the type of eyepieces required to get optimal views with the Starblast. Otherwise, it provides superb views for the price in a small and simple package. The Orion SpaceProbe 3 stands out from the competition with a relatively simple to use equatorial mount and minimum of complicated pieces and accessories. As such, it is a good choice for consumers desiring a basic and easy to use telescope to ease them into the stargazing hobby. At around $140, it is very affordable, while its 3­inch aperture, 700mm focal length, 10mm and 20mm eyepieces, and reflector design give it solid optics. Its steel and aluminum construction and one­year warranty give it a reliable build. The only downside to the telescope is the fact that it can take upwards of an hour to set up properly and may come with difficult to follow instructions, as opposed to other entry­level telescopes can take less than half an hour to assemble. The SpaceProbe also does not automatically keep objects in view, and therefore may require a little extra work from the consumer to track the objects through the sky. However, the SpaceProbe’s optics allow views such as the moon and planets, as well as some deep­sky objects. The combination of simplicity and sound optics make the SpaceProbe a good choice for any amateur stargazer. Delving into the world of astronomy does not have to be an expensive proposition. There is a whole array of telescopes for less than $200 that offers enough features and quality to appeal to any amateur stargazer. Simple designs and quick setups make these telescopes easy to use even for those who have never before owned a telescope, especially if you’re looking for a good kid’s telescope. Sound optics bring the moon and planets into sharp focus, and reliable construction and special features make them quality products that will meet stargazers’ needs for years.